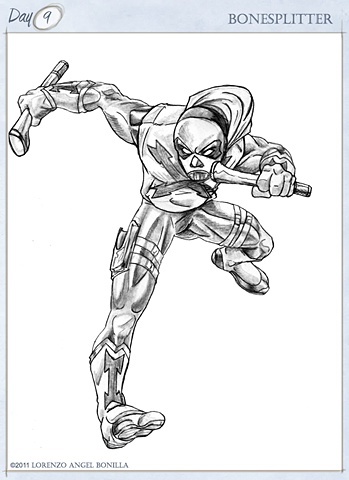 A teen crimefighter trying to do some good with a misnomer for a name, Bonesplitter. Son to a police officer killed in the line of duty during a rash of off-duty officer slayings, Hector Rodriguez decided to seek out info regarding the identity of this mysterious shooter and deliver vengeance under a mask. Calling himself Bonesplitter, because it sounded cool and he got it off of a Magic card, and donning a skeleton costume, he set out making routine patrols. His first attempts at crime-fighting nearly killed him, if it wasn’t for the timely intervention of Azrael, The Fatalist. Though Azrael told Hector to stop being a vigilante, Hector still pursued being a crime fighter, forcing Azrael to actually train him in both combat and in eventually finding his father’s killer; Hector’s final test at being either a hero or a killer was set. The end result was Hector taking the high, yet hard road by putting the killer behind bars, to which Azrael rewarded him with a new, more durable outfit and a set of battle sticks shaped like femurs. When the Frontline was forming, Azrael vouched for Hector, but as he was still a minor,could not be made an official member, yet is given Junior Status with the Frontline as it is better to train the next generation than to leave them out on their own. Currently, Hector juggles his senoir year at high school and his masked identity as Bonesplitter dealing with crime within his community in Pilsen, yet when needed, will be called upon to work alongside the Frontline. Abilities: Hector has the strength, stamina, and speed of a young man in his teens. He possesses moderate to skilled level in open-hand and weapon combat thanks to Azrael, as well as some proficiency in throwing weapons and in free running. His costume was originally a store bought Skeleton costume with a simple hooded sweater and his late father’s baton. Azrael gave Hector a new suit designed with a Kevlar/Nomex weave and his hoodie was reinforced with ceramic armor plates etched inside the sweater, and two carbon steel batons, shaped like femurs to use in stick fighting and mid-range projectiles. The batons also possess a taser charge. Azrael also equipped Hector with an assortment of tools to use in his endeavors, including a grappling gun, smoke bombs, and a taser. Creation: This character was inspired by one of Street Fighter’s EX characters, Skullomania, and I just thought it could work as a teen superhero concept in the vein of an early Spider-Man/ Nightwing aesthetic. His second outfit is the one I went with as it was easier to draw than the original full skeleton concept costume and the Scarlet Spider nods in regards to a hoodie work for a teenager.